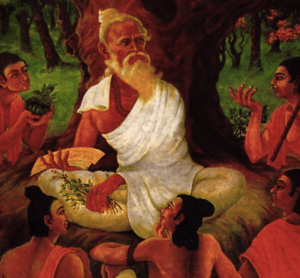 Jivaka was a Sage, a Vaidya, Ancient Ayurveda physician, the disciple of the Great Sage Atreya. As the story goes, Lord Buddha who upon selecting his personal physician sent several physicians into the forest with the task of finding as many plants as they could with no medicinal value. Each physician brought back many samples of plants that they felt from their experience and meditations had no value. One Vaidya by the name of Jivaka came back empty handed. He explained his frustration to Lord Buddha. “I am afraid I have failed you, he began, I have spent much time in the company of all of the plants in the forest but their is none that I can find with no value to someone. ” Upon hearing this, Lord Buddha selected Jivaka as his personal physician. Indeed, Ayurveda recognizes that the earth is packed with medicines, every grain of sand can heal us if we cultivate our Inner Medicine resource. Not only do Nature’s plants and herbs and barks and tree-essences, plants, seeds, grains, and fruits heal us, but water, air, ghee, space, sound, breath, colors, aromas, and movement are all healing steps.